My standard of measure is the following: Does something amaze me? Can it shake me up in a positive way? Does it make me more capable? Does it give me insight? In short: Does it have anything to do with me or doesnÕt it? The work of Xenia Hausner definitely does. She practices the craft of painting human figures. Her main talent is character studies. She presents us with bodies and faces. With nuances of color, she captures moments of destiny on canvas, in a magnetic mixture of affection and mercilessness. And women. Again and again, women. What Lucian Freud accomplished for the perception of men in painting might one night in the not all too distant future become an achievement of Xenia Hausner as regards women. I see Xenia Hausner’s “report from the lab” as an important experimental excursion into a dialogue between media, in which her unshakable artistic authenticity shines through. On the one hand, we are familiar with the traditional role of photography as a tool. From the dadaist collage to the combines of Robert Rauschenberg or especially Andy Warhol’s aesthetic, philosophical reflection, however, the problem of identity exists that is brought to a head by collage and montage, as well as alienation in prints, with their questions as to the reality and truth of the Images. 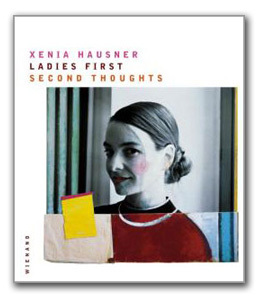 Xenia Hausner offers new, contemporary evidence on this subject from her “lab”. In doing so, she explores aesthetic questions in the shadow of her painting that can, in turn, become relevant for the new, painted production. In her “combines” the parts of a figurative or abstract puzzle help to bring answers for the story of the portrait subject. The viewer identifies the portrayed person with the abstract additions, patterns and ornaments, colors and shapes of the inserted pieces, which thus “extend” the portrait. The Hunter: You certainly won’t find them around me, your little dwarfs. I’m the officer in charge of open spaces not of the complications that might occur within them. Naturally I notice when something moves into my open space, a corner, a sequence of being in animal form. I can assure you that I’m not as eagar for the second consequence as is my gun. It pants and drips and wheezes – no, the other way around. Actually I’d prefer to keep an open space in myself and store it like Tupperware. That’s why I became a hunter. That’s why I’m not interested in the dwarfed truth you’ve been looking for in this forest of all places. I’m the giant untruth. Delete everything there is with my all-encompassing delete program. But when I graduated from school my major was the Truth. If I have to, I can act it out too. In such a way that you and even myself believe I am the truth and moreover the last of it still on the market. For the longest time I’ve been coming up with this come on. The circumstances of my life: secretly stationary next to decency, like a stanchion of stationed fakery in front of the animals, a couple of big ones, just like oneself, squeeze. That’s the end of that being. Just look, that’s the end of the judgement. It won’t have to fear any judge. The only one who doesn’t have to fear the judge is Death. I am everywhere and always legally on the road, even when I sometimes like to go over the speed limit like over the river of death with a single step of my stubbled legs. I like to cut up pictures and piece them together again. That’s why I work on wood. During the trial period, the painted pieces are usually out of cardboard and are pressed impatiently onto the picture with heated wax. These work-rituals have become so dominant that it’s become completely irrelevant how to begin because it’s obvious that piecing together is a part of the process. Over time, the pleasure in piecing together has become automatic. The cardboard pieces, consisting of a variety of fragmentary motifes, yield a collection of colorful set pieces which, during the work-process, only the trained eye is able to delegate to a specific picture. Moreover, I’ve been collecting various kinds of paper for years: wrapping paper, printed bags, etc. Especially when I’m traveling my attention is often intensely drawn to very trivial things which attract my gaze because of some color or some strange pattern. Formerly, these found objects appeared among my images as painted still lifes. At present, they are often incorporated directly and create a bridge between the photographic and the painterly. In contrast to digitally manipulated photographic art, I make use of the tools of the painter: brushes, color, scissors, cardboard, and establish the connection between color and photography via an analogue system. A photograph functions as a stimulating carrier for the application of color. My curiosity when dealing with the basic image material – all work-process photos are taken exclusively with a 35mm camera after being deemed essential for painterly purposes — has inevitably led me to the point of not being able to control myself colorwise and of conceptualizing the photo image beyond the basics and supplementing it. In this way the plot continues to develop differently. The actors are confronted by a new situation. Peter Weiermair has used the term “Combines”. Spontaneously, that makes me think of “Concubines” – the ladies (first) of my choice who share my life in the studio. Their life histories are to be told in new ways – a fact that leads to novels that follow another course. People are still at the center of focus, their entanglements get stranger. Threads of the plot that used to run linearly get tangled in mysterious objects. The book pursues the intellectual tendency on a graphic level and documents the way to the real object.